Following on from Gregory DiPippo's recent post about the Burying of the Alleluia, we are pleased to reproduce this article by Rev. Scott A. Haynes about the burial of the Alleluia under the Altar Cloth of the Lady Altar which takes place at St John Cantius today. This article originally appeared on the St John Cantius website here. 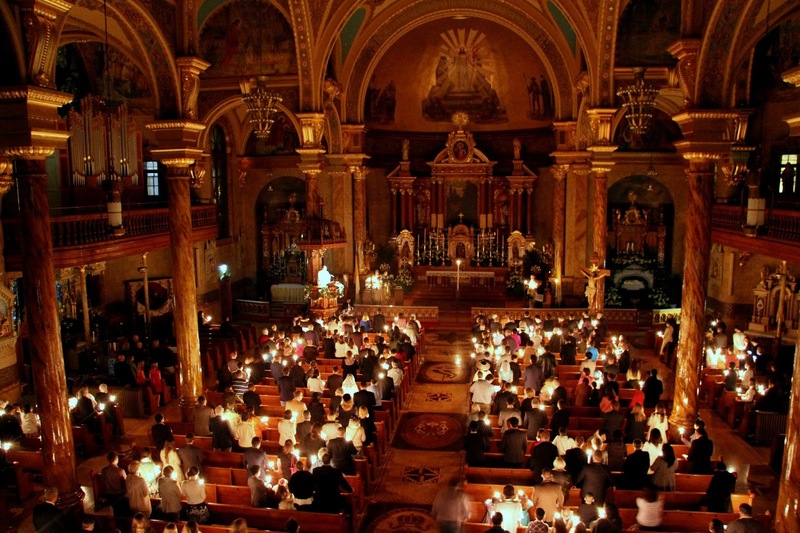 The Burial of the ‘Alleluia’ is a beautiful custom repeated each year at St. John Cantius Parish. On the Sunday before Ash Wednesday, we bid this sacred word a fond farewell for the duration of Lent. At the end of Mass, a placard with the ‘Alleluia’ in ornate gold letters is taken from the Sanctuary and processed to Mary’s Altar where it is “buried”—placed under the altar cloth. The ‘Alleluia’ will only emerge again at the Easter Vigil after the 40 days of Lent, we hear the Church proclaim the Resurrection of Our Lord. In the language of prayer, some words need no translation. Amen is such a word, a Hebrew word of assent meaning “so be it,” by which a congregation affixes its signature, if you will, to the official prayer of the Church. The Kyrie eleison (i.e., “Lord, have mercy”) remained in Greek even after the Roman Rite adopted Latin as its mother tongue. Alleluia is a word familiar to all Christendom, whether the language of the local liturgy is Latin or Greek, Spanish or Ukrainian, Polish or Vietnamese. It is the Latinized form of Hebrew’s Hallelujah (i.e., “Praise the Lord”). In the West, we associate Alleluia with the joy of the Resurrection and Easter. Consequently, the Church buries the Alleluia while we put on the ashes and sackcloth of penance. In the house of God abiding thus they sing eternally. But by Babylon’s sad waters mourning exiles now are we. There to Thee forever singing Allelúia joyfully. This burial of the Alleluia was nicknamed the deposition (i.e., “the giving on deposit”). Curiously enough, gravestones in Catholic cemeteries traditionally had the inscription Depositus, or simply “D,” to indicate a Christian’s burial. When this term indicates the burial of the Alleluia or of the faithful departed, the Christian belief in resurrection is clear. As we bury those who have been “marked with the sign of faith,” (Roman Canon), and as we enter into the fasting of Lent, we do not silence our tongues because of despair or permanent loss. Rather, we do so with confidence that what has been deposited into the earth—our dead, our Alleluia—will rise again. Yet in this period of preparation, we remain keenly aware of the mystery of sin and of our exile from the place where Alleluia abounds. So until we return to the New Jerusalem, let us not forget the sin that continues to devastate our world and our mission to heal what has been broken. Chicago’s St. John Cantius Parish has adopted the noble custom of the Burial of the Alleluia for use in the Modern Roman Rite (i.e., Ordinary Form). On the Sunday before Ash Wednesday after Holy Mass, as the choir and congregation sings the traditional Alleluia, dulce carmen, an altar boy holds a large ornate board on which is inscribed Alleluia in golden letters. He leads the joyous procession to the Lady Altar where the board is solemnly buried underneath the altar cloth until the Alleluia is resurrected at the Easter Vigil, as the great moment arrives when the deacon approaches the Bishop with the words, “I announce to you a great joy: it is the Alleluia.” And the priest sings it in three different keys before the gospel of the Holy Saturday Mass, the choir repeats it jubilantly, and we all rejoice again: Alleluia!